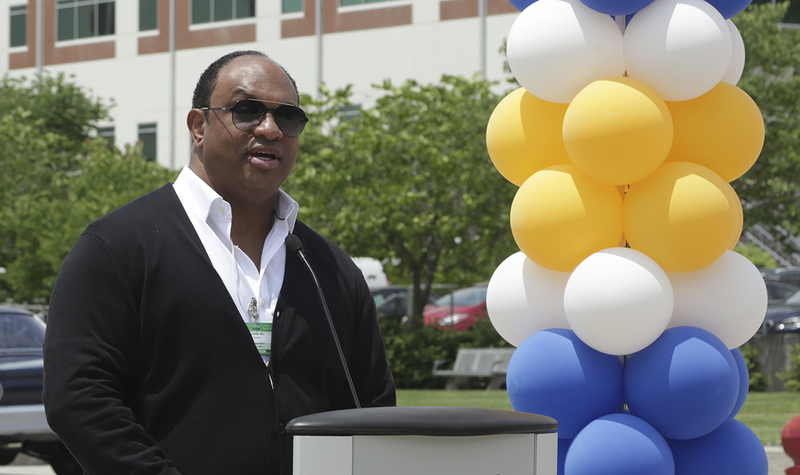 Knoxville radio and TV personality Hallerin Hilton Hill encouraged employees to support those in need during opening ceremonies for ORNL’s 2017 United Way campaign held June 1 on the ORNL Quad. “One of the lessons of life is that of giving,” Hill said. “When you learn to give something without expecting anything in return, it does something for you. The United Way has organizations that provide meals and help people set up a new life. It is because of someone’s giving.” Hill said the InterFaith Health Clinic – a local United Way agency – helped his family. “When I moved to Knoxville 27 years ago and I didn’t have a job, the place I went for help was the InterFaith Health Clinic,” Hill recalled. “Someone made a contribution then to help my family and me. When they made that contribution, they had no idea I would be showing up to speak out for United Way five years later. They had no idea who that contribution was for, but they knew it was for somebody and that turned out to be my family. “ Hill said many East Tennesseans are in need and contributing to United Way helps the contributors as well as the recipients. If you are interested in contributing to the ORNL United Way campaign, please go https://portal02.ornl.gov/sites/unitedway/Lists/Forms/AllItems.aspx.